A residential structure preferably has an N-sided polygonal footprint which has a central vertical axis. Inner walls separate a central common area from a number of outer individual residential units, each such unit occupying a sector of the footprint along an associated side thereof. Advantageously, the central common area includes a pool in a courtyard. The building is a low-rise, hurricane-resistant condominium and townhouse building. The octagon design combines engineering, architectural and wind shear principles to create an attractive, futuristic, hurricane-resistant structure. The patent covers a building that could have both residential and commercial applications. The patented building may include a complex of several buildings on 100 acres. The designer has several years of experience working for an aircraft designer/manufacturer and for a builder of residential real estate. The structure may include a hardened aluminum roof skin (similar to that used on aircraft) with composite material bonded for strength. One building's foot print, 1st and 2nd floor, is 26000 square feet. Condos are single units, and townhouses may be 2 or 3 bedrooms. One townhouse is 2,176 square feet plus a garage. One single, top floor unit 1,291 square feet. One single, bottom floor unit is 885 square feet plus a garage. A courtyard in each building is 4,000 square feet. Each unit includes a bathroom designed to be a safe room. We have a restaurant design for the interior of the same building shell. The building is buildable using existing technologies, including wood and masonry design manuals. This is a patent that addresses the need for hurricane-resistant condominiums and townhouses in the United States. We are interested in forming strategic partnerships for the construction of the building, which may include as a complex of several buildings. We are interested in licensing or selling the patent rights. 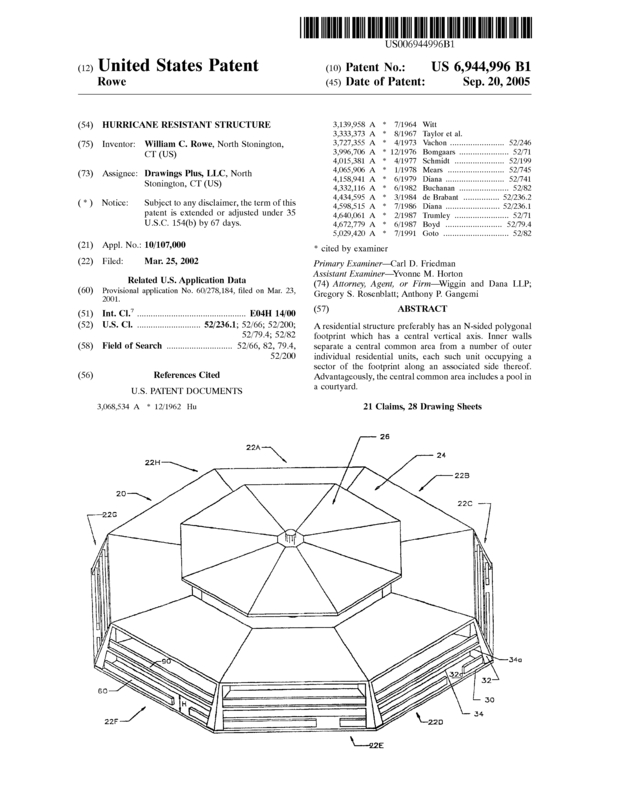 Page created at 2019-04-25 4:12:20, Patent Auction Time.